A first draft remix of the previous ortho-lattice diagram. This view introduces a new factor, the square root of Entropy (√H). If the universe is founded on pansensitivity or Sense (–ℵ), then the initial fracture is between the particular aesthetic qualities which stand out (Qualia æ), and which are anesthetized* (√H). This primal choice between what gains attention and what loses it is equal to Motive (Ω), and represents the midway oscillation between sense and entropy. Entropy or Panentropy (H) is defined as the contents of the formula in the box, ω = E/∞. i.e. when “energy”** it means that a sub-personal sensation is quantified, it is decomposed spatially to position or temporally to disposition. This branching of quanta is also the branching of analog (proprietary likeness) and digital (generic substitution). 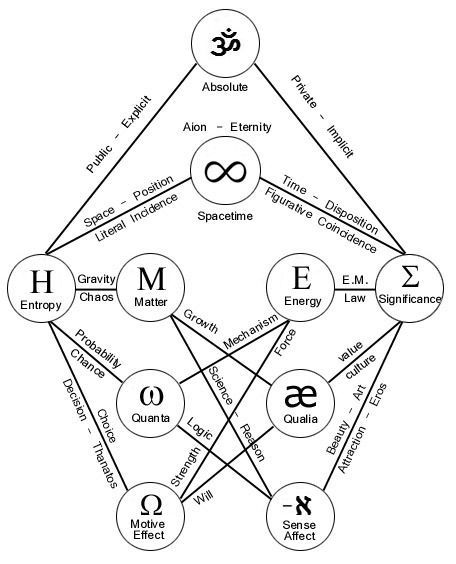 The formula on the top is more or less a rewording of E=MC², only with Matter (M) instead of Mass, and Quanta compressing the notions of energy and spacetime. Adding Significance (Σ)† to the formula makes it about the concrete realism of physical substance, rather than conceptual inertia or drag on acceleration. Unlike mass, matter is a three dimensional presence which is an anesthetized embodiment of significance. Note the inverted parentheses in the sensory-motive formula denotes its fundamental receptivity and interiority relative to the Matter-Significance formula on the top (denoting exterior forms/bodies). * Anesthetized = unintentionally ignored, masked, elided, alienated, automated, mechanized, or ablated. To be made ‘other’, impersonal, inanimate, etc. † Significance is the sum of sense squared (–ℵ² = ℵ) or cardinality; sense of proprietary motivation – identifiable likeness. 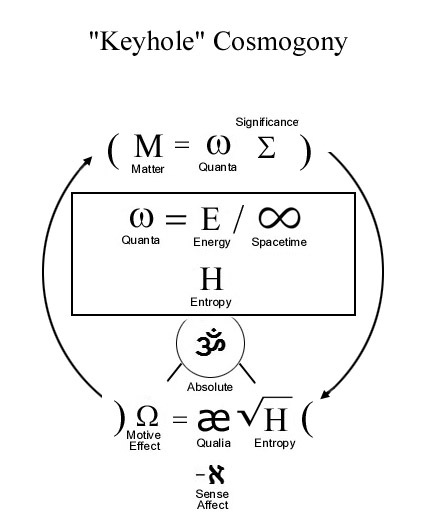 You think about a conceptual understanding of entropy in what terms? Practical-perceptual coping with entropy is not itself a locus of conceptual articulation. Why? Conceptual understanding with something external to our practical-perceptual involvement in the world, would then have to become “operative” in perception. Conceptually articulated discursive practice, with regard to entropy, is a distinctive way in which practical-perceptive bodily skills would develop through a niche construction and co-evolution of language and language-users. Because I start with pansensitivity as the primordial Absolute, Entropy is the property of sensitivity to mask itself. It introduces a divergence of sensory-motive privacy as mass-energy publicity and information-theoretic space-time.